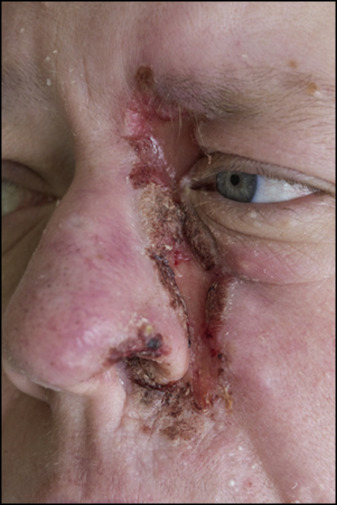 Photograph of the ulcer extending outward from the left nasal ala. Upon presentation, the patient was afebrile and hypertensive to 199/81 mm Hg. Physical examination revealed prominent tender left-sided preauricular and submandibular lymphadenopathy and a linear crusted ulcer with jagged edges extending from the inferior aspect of the medial left eyebrow to the left nasolabial fold (Figure 1). Neurologic examination was notable for left-sided ptosis and miosis, decreased sensation to fine touch and pinprick in the distribution of the left maxillary division of trigeminal nerve, and decreased sensation to fine touch on her right torso. Laboratory evaluation showed C-reactive protein of 0.9, erythrocyte sedimentation rate of 48 mm/h, white blood cell count of 8.45 K/mm3, anemia with hemoglobin of 10.9 g/dL, and mean corpuscular volume of 79.8 fL. Hemoglobin A1c was 12.2%. Human immunodeficiency virus antibody testing was negative. Antineutrophil cytoplasmic antibody, anti-DNA, antinuclear, anti-Ro/La, anti-RNP, and anti-Smith antibodies were negative. 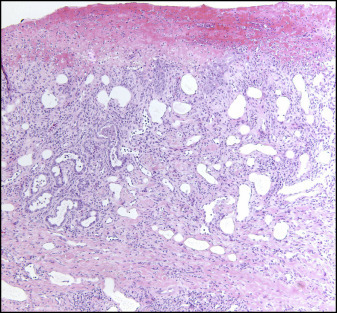 Punch biopsies were performed, with histopathology showing underlying granulation tissue, dermal fibrosis, fat necrosis, mild focal chronic inflammatory infiltrate, and no evidence of malignancy (Figure 2). Acid-fast bacterial, fungal, mycobacterial, and viral cultures were negative. Wound cultures grew heavy methicillin-resistant Staphylococcus aureus. Maxillofacial computed tomography showed skin thickening and subcutaneous fat stranding from the left nasal ala to the medial left infraorbital region inferiorly to the level of the left nasolabial fold and philthrum with lymphadenopathy from the left parotid gland to level IB.